News > Primary > Are you on the right track to STEAM success? Why are the arts so important? The arts bring creativity to the forefront of every lesson and encourage children to think about concepts in a more artistic way, giving them the freedom to express and explore on a deeper level. It gives us a simple and fun way to introduce coding and engineering from a much younger age. After all, children are curious; they use exploration and discovery to imagine and act out stories from a young age. These same ideas can be applied in the classroom to develop early maths, science, and language skills. For example, using an amusement park as the theme, children can learn about gears, motions, and measurements in our ‘STEAM Park’ set. Similarly, our newest preschool resource, Coding Express (coming in 2019) involves building a train track and exploring basic coding concepts including sequencing, looping, and conditional coding to bring the train to life. Engaging children in practical and playful tasks that teach them about early coding concepts will kick-start a sequence of STEAM learning which can be built upon throughout their lives. What can schools do to introduce this way of learning? Making activities hands-on and relatable is vital to capturing the imaginations of pupils and helps them understand the purpose of lessons. Physical tasks give insight to coding and by experimenting through play pupils can add sensors or motors, debug errors, and develop problem-solving skills. It’s also important to ensure that what is being taught relates to the real world. For example, our primary resource WeDo 2.0 includes challenges ranging from creating a floodgate that controls water flow, to understanding infrastructures and the impact of earthquakes. These kinds of activities also give teachers greater flexibility in teaching coding through the integration across a wide range of subjects, as this conceptual layering helps build a solid understanding of how coding works. What skills can be developed from STEAM learning? STEAM learning gives pupils the freedom, flexibility, and creativity to explore various solutions and develop important skills including confidence, teamwork, resilience, and problem-solving. While it’s of course important to develop every child’s academic ability, it’s also about equipping them with the knowledge to thrive in the future. Things like learning that it’s okay to fail, the importance of persevering and that there isn’t always only one right answer. 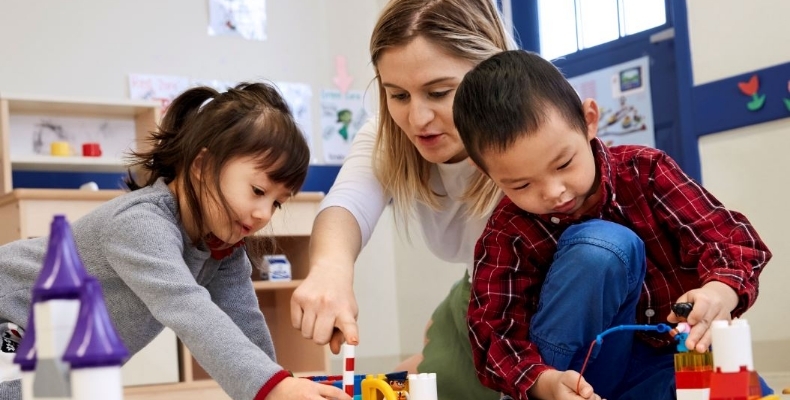 Learning about STEAM subjects through hands-on activities and challenges should start during preschool in order to build foundational knowledge. This can then be reinforced through to secondary school, encouraging an effective continuum of learning. What can schools do to engage older students? At secondary level, coding is often ramped up with students being introduced to more complex concepts. Therefore, we need to provide solutions that simplify complexities and provide engaging, tangible activities where students can physically see the results of the code they have put together. Secondary resources like LEGO MINDSTORMS Education EV3 allow students to design their own machines, vehicles, or models on a simple, easy-to-understand platform that uses various mechanical elements to really make a project their own. Open-ended tasks allow students to make their own interpretations, trial different solutions and work together to combine strengths and overcome problems. From preschool through to secondary and beyond, we need to provide children with the opportunity to be curious, get creative and unlock their full potential. LEGO Education will be joining the CreativeHUT stand (F70) at Bett this year to showcase its hands-on STEAM resources that promote a continuum of learning.